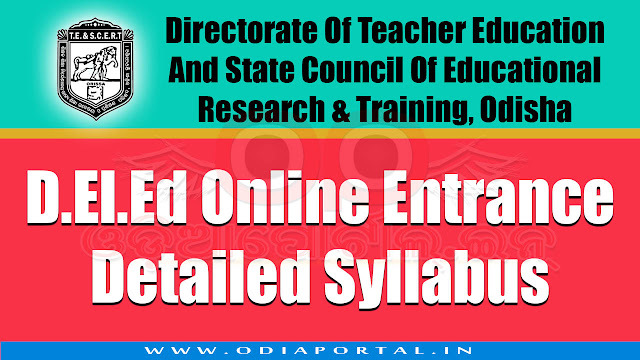 From this year (2018), SCERT Odisha to conduct entrance exam in Online mode to select eligible candidates for various teaching courses such as D.El.Ed (C.T. ), B.Ed., B.H.Ed., B.P.Ed, M.Phil etc. The following the detailed syllabus for D.El.Ed (C.T.) Online Entrance Exam 2018. Selection for admission to the D.El.Ed. Course (General, Urdu, Telugu & Santhali) shall be made through an Entrance Test. The Online Entrance Test shall have Two Sections. The whole test is of 90 marks. Negative Marking : The performance of the candidates shall be evaluated both on the basis of correct and incorrect responses recorded on the OMR sheet. For every incorrect response, 0.25 mark shall be deducted from the marks secured by the candidate for correct responses. Section – I carries 30 marks. There shall be 30 questions, each carrying one mark. Section I shall include four aspects, which have been detailed out. issues related to teaching-learning strategies.